After building successful the application “Building an Application for AT91SAM7S withFreeRTOS RTOS and IAR”, in this article we will combine FatFs, a FAT file system module, with FreeRTOS to make an application with functions more diverse than. FatFs is a generic FAT file system module for small embedded systems that can be ported to any underlying hardware. It has been architected with separate layers for hardware accesses. FatFS is compatible with Windows FAT12/16/32 file system (Figure 1). As any libraries, to use FatFs you need include its source file to IAR. FatFs supplies main source files in directory FatFs/src and some option files in directory FatFs/src/option. We add these two directories to IAR as figure 2. There are three header files (.h) in FatFs for using. - diskio.h: This file stores prototype for I/O driver interface of FatFs. We should create a file diskio.c which is implementation of this header file. Details of implementation, refer below: Implement I/O driver for FatFS. - ffconf.h: this is file for configuration of FatFs. Refer http://elm-chan.org/fsw/ff/00index_e.html for details. You must provide the following functions to FatFs to give control for read and write to the SD card. - Disk_initialization: Required for initialization of the SD card. - Disk_status: Required to get the status of the SD card for read and write. - Disk_read: Required to read the data from the SD card. - Disk_write: Required to write the data to the SD card. - Disk_ioctl: Control device dependent features. Since the FatFs module is completely separated from the disk I/O layer, it requires the following functions to access the SD card. The low level disk I/O module is not a part of the FatFs module and hence the above APIs are provided to access the SD card on AT91SAM7S Evaluation board. All above APIs were declared in file diskio.h , we will implement these APIs in file diskio.c. SD card supports some protocols to communicate with host system. Here, we use the SPI protocol for communication between SD card with the host system (the evaluation board). Refer to AT91SAM7s datasheet to read more detail about SPI protocol on AT91SAM7S256 MCU. In addition, Atmel supplied a library for SPI peripheral. We will use this library to implement I/O driver for FatFs. The following sections provide more details on API implementation. //CTRL_SYNC    Make sure that the disk drive has finished pending write process. // When the disk I/O module has a write back cache, flush the dirty sector immediately. // In read-only configuration, this command is not needed. //GET_SECTOR_COUNT    Returns total sectors on the drive into the DWORD variable pointed by Buffer. // This command is used in only f_mkfs function. // of sector into the DWORD variable pointed by Buffer. // When the erase block size is unknown or magnetic disk device, return 1. We will add a new task in the previous project. This task, with name vRWFileTask, will write a text file to SD card and then read its content again to check, it also reads all contents of Root directory in SD card. To prevent SD card is damaged, task vRWFileTask only run once. After that, it deletes itself. 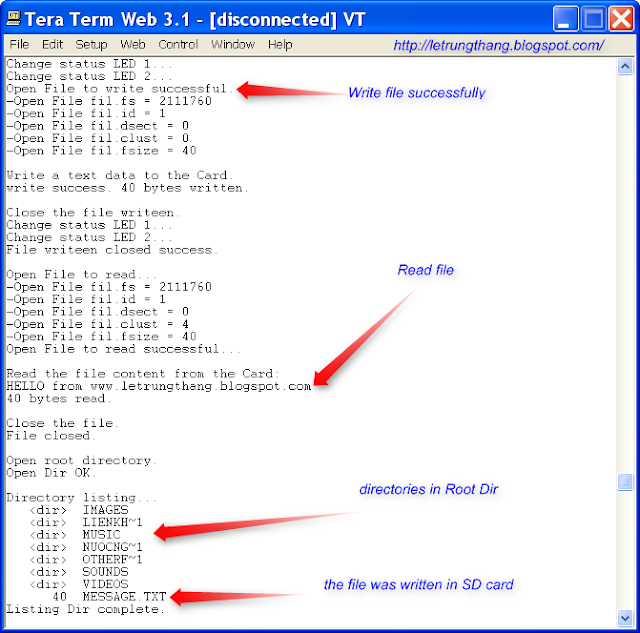 the method to access to SD card is same with the method to access to a file in the standard C program. That is to call in sequence: open file (f_open) -> read/write file (f_read/f_write) -> close file (f_close). Sometime, open file operation was failed, so we will retry to open file one more time. 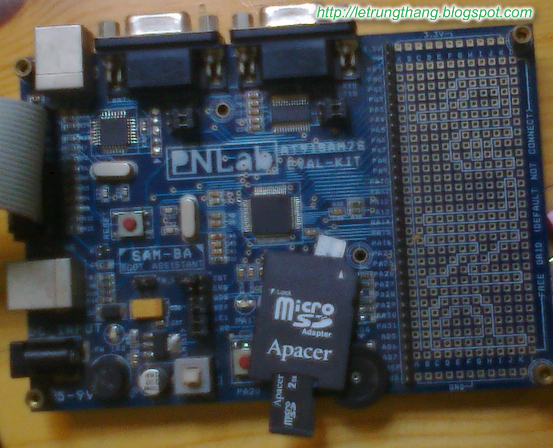 Program was tested success with Micro SD card 1GB and 2 GB. Source code can download here. Fatal Error[Pe035]: #error directive: Board does not support the specified chip. What I need to configure? So what I have to do ? P.S. Card initialises successfully with library mmc.h and it's functions, but it doesn't help with SDSPI_Write. I have a AT91SAM7S128 chip and Olimex board. Did you use which tool to build ?. 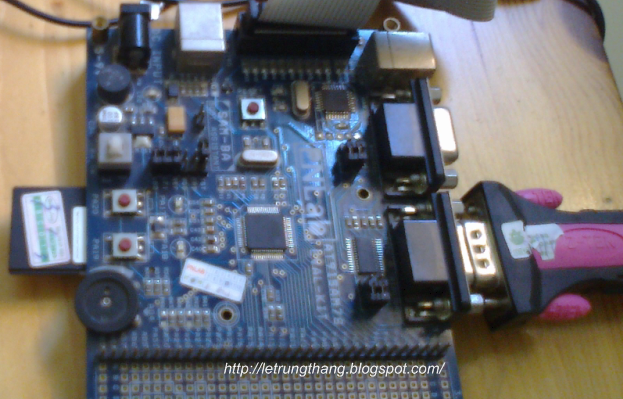 I use IAR Embedded Workbench for ARM 6.30 and build with result success. Choose Rebuild All to rebuild project. The project only supports in the IAR tool. I also need check which MCU you are using in your board: AT91SAM7S256 or another ? If it is different with AT91SAM7S256, then you need modify again the linker file. I'm using IAR 6.1. MCU type is AT91SAM7S128. Copy it to D dir (no C dir) and unzip. Please don't modify anything. If you are using the Evaluation edition, you might not build the project. - Expires 30 days after generation of the evaluation key. - MISRA C is not available. - The runtime library source code is not available. - The object files generated by the compiler are in an encrypted form and will only be readable by the IAR ILINK linker. The linker will also read AEABI compliant ELF/DWARF code for linking of legacy and third party code. - Compiler assembly list output is disabled. Thanks for files. I'll added some lines to "additional include directories" (it were errors trying to find ff.h, stdio.h and crc7.h). After that the project succesfully was build. 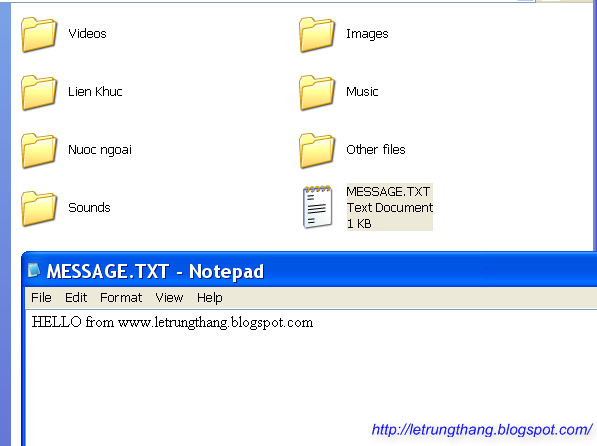 I changed MCU type (without editing linker file) and project still worked. There was a problem with 32 Mb sd card, but it's ok with 4 Gb sd. I'll also try to start project without OS. I need to convert pictures 320x240 on sd card to pixels and to show them on a simple display. Maybe you can say me some advices or take some useful links for that task? I'm really appreciate your help. Thanks. I want to interface read files from sd card using lpc214x..
krrrish: Due to lpc214x has peripheral different with AT91SAM7S, So you need to re-implement I/O driver files. It's ok with source file. Download it by link above. SDSPI_IsBusy function returns to me '1'. What can be the cause for this?